Having said that this isn’t a whinge about people wanting to contact someone who can spend money with their businesses (well not completely) but I wanted to make two points that for some of you will have you nodding your head and for others maybe an insight into the people you are pitching. 1. It’s been said before and it’ll be said again – networking is mutual, it shouldn’t be all one way. Don’t make contact just to sell, develop a relationship with the individual and maybe, just maybe something will come of it. If most people are like me then they look after ‘The Usual Suspects’ not just in their own organisations but with referrals and recommendations to friends and colleagues. 2. Introducing a new supplier to an organisation is not as easy as having a meeting, signing a purchase order and agreeing the work. ‘Landing’ a new supplier requires influencing the organisation that they are the correct people for the job, are credible and are better than the alternative/the incumbent. That requires two things on behalf of the person who may be your client – taking a risk and spending some personal collateral. They are staking part of their organisational credibility on you and they are likely having to use some of their collateral in persuading the other stakeholders to go with you. They are far more likely to do this for a) people they know and b) people they feel have a vested interest in something longer term than their next deal. Earlier this year I spent a fabulous afternoon at the RAF Museum at Hendon. It’s a real boy’s day out – lots of aircraft from the earliest bi-planes to the the Eurofighter. 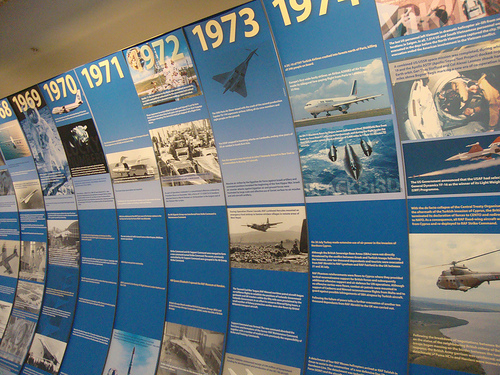 One wall of the first hall you enter is a display representing the first 100 years of flight. Fast forward many months and I was sat with the inimitable Neil Morrison discussing the tribulations of trying to source providers for learning and it’s the reflection of these two events that has lead to this post. When I thought about it everything since the late 60s/early 70s has become far more generic – whether it be retailers, clothes, cars, household appliances, hotels, etc. You only have to look at the ‘new’ format of the HMV stores to see how someone does something new and novel (Apple in this case) and people jump on the band wagon of the next big thing. Have most of us lost the inclination to be individual and act independently from the crowd? When you move this into a work setting you would only have to read my e-mail for about 72 hours to see several examples of people telling me they have exactly what I need (without even asking me) and most of those people have never met me, don’t really understand my role and for the person who told me he could solve our sales training needs – really don’t understand our organisation.What’s more what they are offering isn’t different, it doesn’t distinguish itself and definitely doesn’t give me the inclination to pick up the phone. I asked one of my team for some feedback on a meeting with a potential supplier he’d had last week and he replied with genuine surprise “it was different from normal, they actually asked about what we needed and didn’t just tell me what they could do for us”. I realise in my own work I am guilt, at times, of trying to offer a solution before understanding the problem, but I try to catch myself and thankfully I work with people who are more than comfortable to push back – which is a good thing (most of the time). I realise also that people who develop the solutions to ‘our’ problems are caught in the trap of firstly, needing to demonstrate coherent examples of interventions and products that have they have deployed before and secondly needing to offer a cost effective solution that doesn’t involve a drawing board for every problem but there has to be a balance between the drawing board and the production line, surely? Maybe this isn’t a problem of product/solution at all, maybe this is all about sales technique – making the customer (me) feel they are getting something bespoke without actually making the internal investment or requiring client investment every time. So act one of the Olympics is over and let’s be honest it was the first part that we (the UK, the British, London etc) were on the hook for on the world stage. In the run up to the Olympics (especially the most recent part of it) I didn’t really get involved, express an emphatic opinion although I did challenge a few people being overtly negative about our chances both in terms of medal performance and to actually deliver the event. I realise with reflection it’s exactly the same mode of behaviour I adopt when Wales are playing in a big rugby match they may win but it’s by no means a done deal – internal optimism whilst not saying much one way or the other for fear of it tempting fate. As I sit here just over 2 weeks later I am delighted to have been proven so wrong in my lack of overt enthusiasm – what an absolutely amazing fortnight. 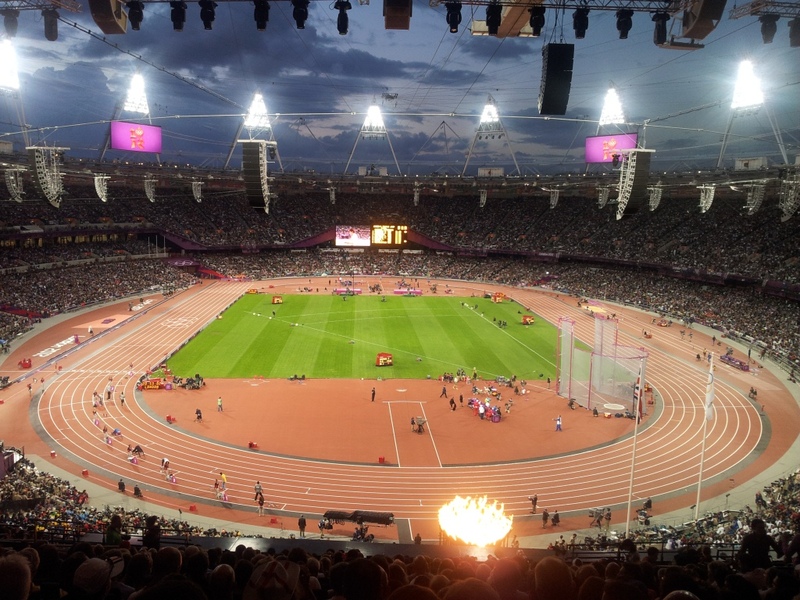 It’s easy to criticise politicians but many of them have staked personal and political collateral to achieve what has happened in London – locally in London both Ken Livingstone for the initial phase and latterly Boris Johnson for his emphatic championing of the games. Barbara Cassani although not a politician was the first chairperson of the bid and her successor Sebastian, Lord Coe, both deserve recognition for leading what must have been an exceptionally complex process to a successful end. LOCOG has taken a fair amount of flack for it’s management of sponsorship and the policing of the brand associated with the London effort. Paul Deighton is the CEO of LOCOG and he must be sitting somewhere thinking a) ‘thank goodness the first bit’s done and b) ‘how the hell do I follow that?’. The team he lead have delivered a great output so he must be feeling justifiably proud. Games don’t run on nothing and the team at ODA (some of whom I now have the pleasure to work with) must be sat looking at the television coverage thinking how great London looks to the world in the facilities they delivered. Sir John Armitt who has chaired ODA and Sir David Higgins who was CEO for most of the work should receive widespread recognition for leading teams who delivered a world class set of venues on time and in budget. Their work has already moved the bar on in terms of delivering infrastructure projects and it’s a high bar that’s been set. One man who I can’t imagine has been more than 3ft from his mobile over the past month is the Commissioner of Transport for London, Peter Hendy. TFL and by reflection Hendy were in that horrid position of having little opportunity to win plaudits but probably in the hot seat to be number 1 villain should the infrastructure not have held up. What is clear is that a lot of planning, investment, communication, structure and effort has gone into delivering the transport during part one of the games and I think the team at TFL have done the city proud. The furore over the security arrangement got so much press in the run up to the games itself it’s been great to see it be a complete non-story for the time the games have been taking place. I can’t imagine it’s because no one tried but public sector and private sector security services have obviously worked together to ensure the safety of all those participating and attending. The final point of recognition goes to us/you/them. I think the mood and behaviour of those attending the games both from the UK and overseas, the people getting on with their lives whilst it was all happening and the genuinely respectful way in which all the participants not just the winners have behaved has been amazing. A credit to all the nations and whilst celebrations have been impassioned, there has been little evidence of gloating and genuine respect for the contribution of all the participants. I’m sure in the weeks to follow we will see lots of articles, blog posts and TV programmes about what happened in London (I am sure because it’s already started) but I write this not to try and cobble together some learning points or to jump on the band wagon but simply because right now I could not be more proud to be British and to see what we can achieve as a country when we set our minds to it. Recently I’ve started watching Aaron Sorkin’s new TV show “The Newsroom”. Whilst it’s no West Wing (will anything ever be) it’s well written and well produced entertainment. It’s set in a fictionalised newsroom of a Cable News Network and the set in the recent past. The first episode featured the explosion on Deepwater Horizon and the breaking of the story that put BP squarely in the firing line. During that time it was interesting as a British person to watch the multinational BP once again referred to as British Petroleum and in what seemed like an effort to mobilise politicians and the world’s media, BP’s British heritage was also squarely in the firing line. Another organisation that’s seen itself placed front and centre recently is G4S. G4S was previously Group 4 Securicor but rebranded in 1996 but with their recent Olympic press I’ve heard discussions about long forgotten incidents – losing prisoners and misplaced security patrols. Incidents that most people haven’t thought about for ages were brought out as people chose to use history to strengthen their negativity. G4S was Group 4 all over again. The fact that CEO Nick Buckles had to appear in front of a Commons select committee and the nation’s press to admit they have come up short on their Olympic recruitment damaged them both in terms of reputation and financially as doubt was cast over their ability to deliver against other proposed outsourcing and their share price took punishment. The fact that Mr Buckles had to admit that he didn’t know until 8 or 9 days earlier must have made the attention all the worse but for Mr Buckles and G4s recruitment was without doubt a strategic issue. I’m sure given the amount of publicity and the need for public statements in a regulated environment the truth of what happened at G4S will never really be known or understood within the recruitment community. I do think it’s a cautionary tale for those who see recruitment as just an operational function within Human Resources. I imagine someone somewhere lost their job over this but not without further protection being put in place to ensure no further reputational damage but it wasn’t Mr Buckles and I’m sure whoever is leading the next big recruitment campaign will be feeling the heat of what must be an increased spotlight. We’re over half way through the Olympics and *touches wood, there have been no reported major security incidences which must be a credit to those that were successfully recruited and the members of the Armed Forces who stepped up to ensure the safety of participants and visitors to the Games. Let’s hope despite whatever part of the process failed we continue to see a secure Olympics and subsequent Paralympics and that someone somewhere took the lessons learned to heart.